Some Winnipeg residents woke up Saturday morning to a messy yard, after high winds wreaked havoc late Friday. Wind gusts got up to 90 km/h, which prompted Environment Canada to issue a wind warning. 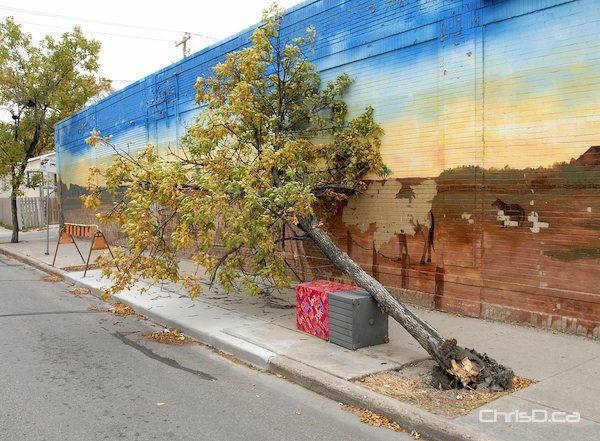 With the fallen trees, broken branches, and damaged cars, Manitoba Hydro was busy itself trying to restore power to numerous parts of the city. Lights at several intersections were out last night, many of which were in the St. James area south of Portage Avenue. The storm also knocked out power to rural areas, keeping crews working overtime to get the lights back on. Crews worked to restore power to some 700 residents in St. Norbert, who lost power as early as 5 p.m. on Friday. Fortunately, we’re in store for calmer weather today, with winds only getting up to 30 km/h.